"I wandered into sound design by accident when I was 25, and I just got sucked in." 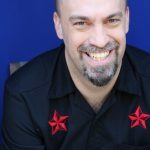 Although Lindsay Jones spent eleven years as a rocker in The Nubile Thangs!, he found his true calling as a sound designer and composer for theatre. He now regularly bounces from Chicago to Los Angeles to New York City (and everywhere in-between), collecting insane travel stories with which he delights his substantial social media following. With John Gromada he was the co-host of The Collaborator Party, a theatrical community event in 2015 that brought hundreds of people together in person and online to celebrate the work of theatrical sound designers everywhere. His original music and sound design were integral to the Broadway productions The Bronx Bombers and A Time to Kill. He has received seven Jefferson awards, two ASCAP Plus Awards, two Ovation Awards, Los Angeles and San Diego Drama Critics Circle Awards, three Drama Desk nominations and the Michael Maggio Emerging Designer Award. I’m working on a ton of things at the moment – I’m in tech for The Madwoman In The Volvo at South Coast Repertory while furiously writing music for The Mystery Of Irma Vep at Indiana Repertory, To Kill A Mockingbird at Resident Ensemble Players, and Othello and Tug Of War at Chicago Shakespeare. I really want to see Lazarus by David Bowie and Enda Walsh. I’m a huge Bowie fan, and am especially curious to see his work in a theatrical context. I wish I was working on it! I was born in Watts Hospital in Durham, NC, which is now the North Carolina School Of Math And Science. I actually have residences in Los Angeles, Chicago and New York, and I bounce around between those places pretty constantly. One of my favorite collaborations was on a show called Among The Thugs, which was performed at Next Theatre (and later The Goodman Theatre) in Chicago. The show was about violence at English football matches, and was this incredibly physical show with a lot of movement. I worked very closely with the director, choreographer, design team and actors to create highly stylized movement sequences, which were really amazing to watch when they were finished. That show really gained a lot of notoriety and as a result, a lot of opportunities opened up for me. First, there's my family, whom I try to see as often as I can. I try to take off every Monday from wherever I am to get back home and spend a day with them. Then, there’s my associates, whom I depend upon to help me with the shows, but beyond that, they are also good friends that I am so grateful to share time with, in and out of the theatre. My agent Jessica Amato at Gersh is an incredibly big part of my support team in guiding me through my career. Finally, I have a small circle of close friends, whom I don’t see often enough, but allow me a chance to be myself outside of the theatre. My favorite piece of music literally changes every hour. A score that I return to again and again for inspiration is the soundtrack to Psycho by Bernard Herrmann. Outside of the obvious shower sequence, there are so many other good cues in this score that I learn so much from about how to match music to dramatic action. I discover new things every time I listen to it. I don’t have a lot of peeves. I would say that something that I find really disheartening is when I’m playing a cue for the first time in the theatre, and the actors make a joke about what they think it sounds like. It may seem like innocent fun, but it’s really difficult for me, as I’ve put a lot of thought and work into those cues. It’s not only hurtful to me, but it also usually taints the mind of the director, which just makes my job harder in the end. I’m kind of weird during tech, I don’t usually like to leave the theatre on dinner break, so I usually bring food back to the theatre. I like to work through dinner break during tech and really make sure that everything’s all good to go. However, once I get to previews, that’s really when I like to go out and have a good meal during dinner break. I love going to good restaurants and really enjoying myself during this time. This is when I get to bond with my fellow designers, and find new restaurants and cuisines to eat. I started off as a bass player. I played and sang for 11 years in a rock band called The Nubile Thangs! Since then, I’ve picked up a number of instruments, which I play fairly poorly. To be honest, I’m not a good musician. What I can do very well is conceptualize music and then I just work as hard as I can to realize what I hear in my head. From that perspective, the computer is my instrument, and I’ve worked hard to learn as much as I can about virtual instruments and sample libraries, so I can use that instrument to the fullest. I’ve always been interested in music and sound, but originally trained to be an actor at the North Carolina School Of The Arts. I wandered into sound design by accident when I was 25, and I just got sucked in. I’ve been obsessed with it ever since. My family does understand what I do. It’s really tough to be away from them as much as I am. But they know that this is who I am, and that it makes me happy to be working on exciting projects, and that I always want to be home with them whenever I can. I didn’t have a mentor. I have no formal training in music or sound at all, and have learned everything on the job. I’m proud of the fact that I’m self-made, and I think that gives what I do a very specific perspective. I do enjoy mentoring others, and am glad to help out designers anytime. I find inspiration in watching actors work with great material. There’s nothing that’s more inspiring than watching an early run-through where everything is really coming together, and I can literally hear the music write itself as I watch it. My first show was Suburbia with Roadwork Productions in Chicago. I had never designed a show before, and was asked to create the sound design because of my rock music background. I made up the whole job as I was doing it, and the show turned out to be a hit, running for 6 months. As a result, I got more calls to sound design other plays, and from there, I’ve never looked back. Logic is my sequencer, and I use BIAS Peak as my wave editor on everything. I also rely heavily on Kontakt for my sample libraries, as well as Spectrasonics Omnisphere and Trillian. Kontakt has really changed my sound design and composition style, because of its tremendous access to any musical instrument or sound out there, and allows me to bring a much more refined and nuanced approach to my music. If you couldn't have a career in a field related to this one, what would you want to do? If I couldn’t be a sound designer/composer, I would be a writer. I enjoy writing humor and there may come a time in the future when I devote more time to it. I hope TSDCA can raise the overall profile of sound design and composition among our colleagues as well as the public, and to give all sound designers access to information and support that can propel them to greater success in the field. What have I enjoyed the most in working on TSDCA? The greatest gift that TSDCA has given me is the opportunity to get to know other sound designers better, and become good friends with them in the process. I’ve now got a great new source of friends in my life, they’re people who really understand where I’m coming from personally, and that’s all due to TSDCA. I really couldn’t be more grateful for the opportunity.